Background Themes have moved to AMO! The move from getpersonas.com to addons.mozilla.org (AMO) is complete. If you have new themes piling up over the past two weeks, we have good news—you can submit them now! As one of the first to check out the results of the migration, please let us know in our forums if you run into any issues. We’re aware that there are still some kinks to work out, so please bear with us! If you had a getpersonas account only, or had both getpersonas and AMO accounts and made sure your email addresses matched prior to the migration, you should be able to log in using the same credentials. On your profile page, you will see any themes you designed previously under “Themes I’ve Created”. On the detail page of a theme you created, you will see an Edit button that will take you to a page with your editing options. You can also go to the Manage My Add-ons page to see a list of themes (and add-ons) you’ve created, along with helpful links to manage them. 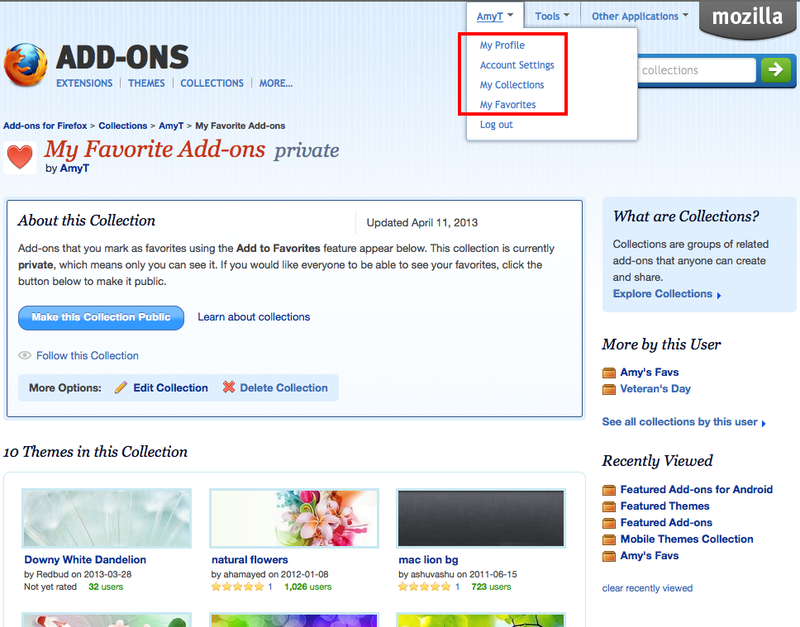 To see your Favorites collection, click on My Favorites from the menu at the top. If you are using the Personas Plus add-on, we’ve updated it to work with AMO; however, due to resource constraints we kept only the most popular features (e.g. local themes and rotating themes), and dropped some of the browsing features. If you are using Personas Rotator, please note that it will not work until the developer has updated it for AMO. If you’re new to themes and would like to try your hand at creating some, take a look at the tutorial! have anything to do with the recent Themes/Personas merging? No, something else probably caused this, not the themes migration. Well, congrats on getting it done. I like the name Background Themes and wish that it had been the official title. I’m sure that the (complete) theme developers wish the same. what about the possibility to merge accounts or to just import the favs from another one, if I did not change the email addresses in time? I’ve pretty much favs – it wouldn’t be fun adding all of them to another acc manually..
Looks like favorite Personas are not merged. The miniature of “LibreOffice 4 Green” which I submitted to Add-ons (unlike the previous 3 that where submitted to Personas) is distorted. The image was resized without concern for proportions instead of clipped. Since this happened, personas + wont recognise I’ve signed in. I click ‘sign in to access your favourites’, and it opens up the themes on firefox addons and shows my favourites. but i go to the personas menu again, and it still asks me to sign in to show my favourites. Try to remove/deactivate Personas Rotator. This solved the same problem for me. Yes, I had to set the add-on completely inactive (in add-on manager). I removed it later, as I use only the rotate favorites function, which works well with Personas+ too. It’s one of the last entries in the favourites menu, where you can see/choose all your favourite personas. You might have to scroll down, if you have more than fits on the screen. me cuesta un poco todavia lo logramos pero lo dificil es mantenerlo, intocabñle. muchas gracias!!!! I still have some errors still and am wondering how/who to contact about them. Where´s my all favorite themes of personas!!!!!??????? ?